Today and tomorrow we will be changing pace a little and looking at two very simple, classic-style cocktails using Averna. The first takes us to the Shangri-La Hotel in Vancouver where award-winning bartender, Jay Jones, gives us his "Four Horsemen." Jones, or "BARJONESING" (who you can follow @BARJONESING on Twitter), is a veteran of the Vancouver scene, having been behind the wine, beer, and cocktail programs at some really great places in town, including Nu, Salt, Voya, the Donnelly Group, a five year stint at one of my favourites, West, and also co-created and opened Pourhouse in Gastown before heading to Shangri-La in early 2011, where you can now find him behind the bar at Market. 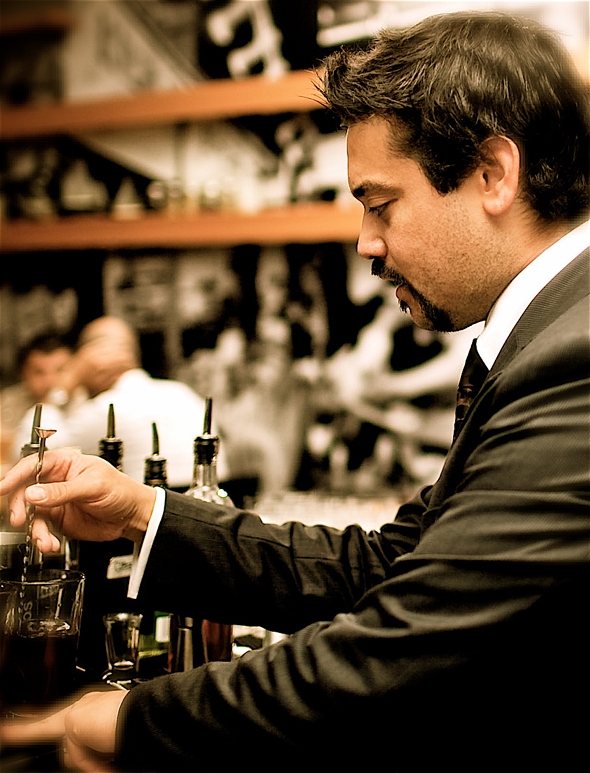 He's a Certified Specialist of Spirits, a founding member of the Canadian Professional Bartenders Association, a contributing writer at Montecristo and Urban Diner magazines, a multiple award-winner (including a few Bartender of the Year awards, and the recently announced "Most Imaginative Bartender" by GQ Magazine), and despite only having the chance to be served by him once so far, I can say he's definitely one of the most talented bartenders I've had the pleasure of meeting. Needless to say, you should head to Market and meet Jay when you can, especially if you feel like learning a thing or two and enjoying a perfectly balanced cocktail. Famine - Angostura Bitters - the scent and taste of the bitter end approaches with certainty. "Bitterness is certainly essential to the structure, but also dictates the flow and complexity across the palate. Averna is the body of the drink - fattening the personality with sweet tones of coffee and chocolate. It's bitterness is amplified by a heavy dose of Angostura. I tried a variety of different aromatic bitters, but in the end, it was good 'ol Angostura that gave me the tone I sought. Abricot de Roussilon provides a very specific sensual nuance - not just expressing apricot, but also almond, coffee, coconut, plum, and cherry-like subtleties derived from its drupe genetics. [It's] complexity allows it to play immensely well with others." Combine all ingredients with ice in a mixing glass, stir gently for 15-20 seconds, then fine strain into a cocktail coupe. This is a nice departure from the mostly modern cocktails that we are seeing this month, and Jones hopes it will some day be looked upon as a modern classic. Take a trip to Market, have him make you one, and you be the judge. 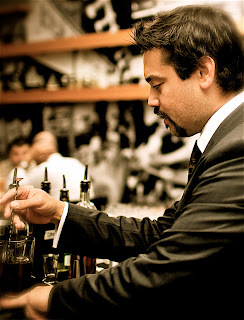 Thanks to Jay Jones for his excellent contribution and for being such an important part of making Vancouver the cocktail destination it has become today!